We took several completed UMCOR "Cleanup Buckets" and a number of"Health Kits"...but recognizing the continuing need for these items for outreach to those displaced by disasters near and far, we continue collecting and assembling these supplies year-round. For specific items needed and size requirements, go to the UMCOR website. held from June 10-13, 2015 at Hofstra University. 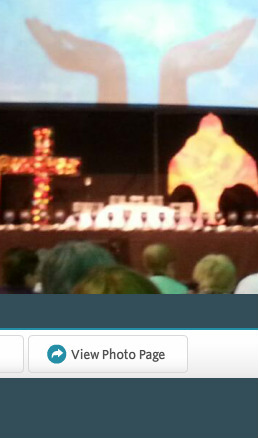 Conference opened with a combined clergy/lay Opening Worship Celebration and Communion at 1pm in the arena. Thursday evening was the Celebration of Retirement for those who are ready to meet a new phase in their church life including our own Catskill Hudson District Superintendent, James W. Moore. As Bishop Middleton reminded us however, their retirement does not mean God (or the Conference!) is done with them yet. Looking forward to seeing what the future holds for Jim... Perhaps as an itinerant Wesleyan minister? Thursday morning we shared a very moving Service of Remembrance for those who have gone to join the Lord in the past year. For each name they ring a gong as a white dove flies across the screen. We also remembered our baptism with water brought from churches around the conference and celebrated Holy Communion (with special gluten free bread). You will all be excited to know that our denomination's beloved founder John Wesley is alive and well in heaven and stopped by for a visit at Thursday evening's gathering! He treated us all to a little sermon on conference as a means of Grace in the early Methodist Church. Wednesday: Pictures of the ever-changing backdrop and conference area. We began this morning with the annual Town & Country meal. 2015's speaker, Jim Stinson, warned us about the perils of falling prey to ageism and empowered us to instead seek out and empower those older adults in our congregations to become active and vital members. Although perhaps we are pretty good at this already. His message spoke of making the most of the congregation you have instead of wasting time and hurting feelings by wishing for something different.